In South Bethany, five generations of women smile at the matriarch’s house . 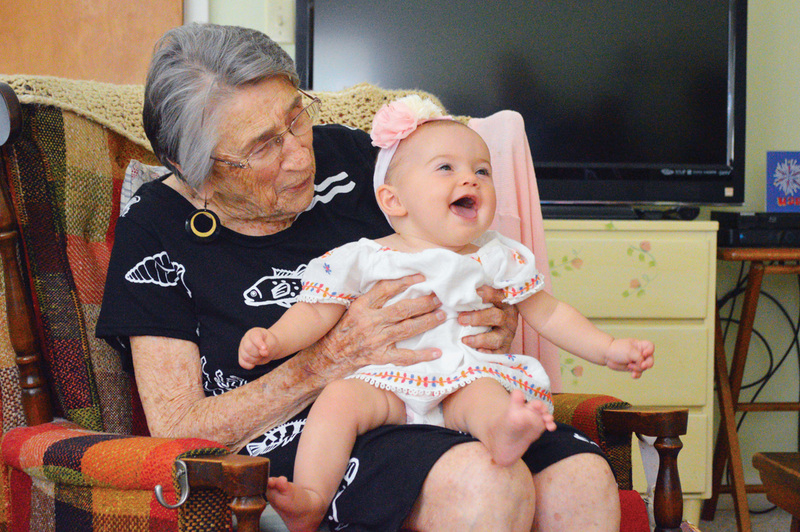 Vinnette Fowler, 102-years-old, meets her great-great-granddaughter Alma Lantsman, 9 months old. Vinnette Fowler’s family describes her as a social butterfly. She loves having company, and her South Bethany home has been her family’s go-to destination for decades. 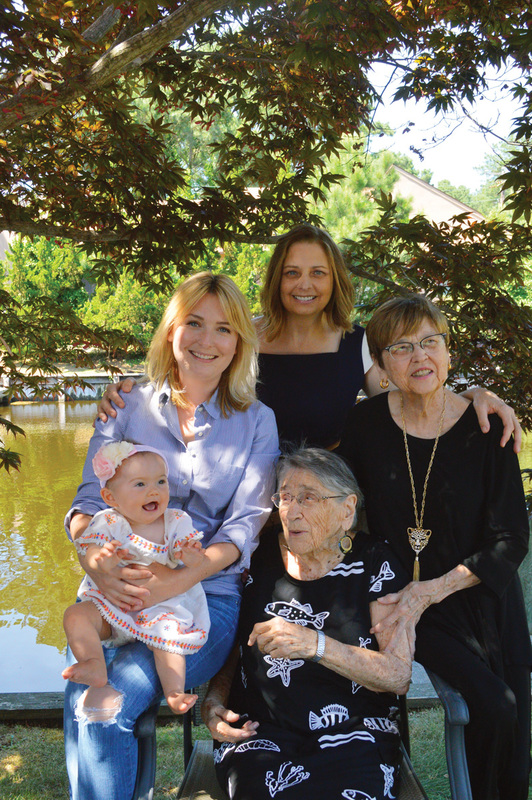 This month, the 102-year-old enjoyed the best type of family visit: five generations of family, in fact, including meeting her newest great-great-granddaughter for the first time. “It’s just so wonderful. She’s so beautiful,” Fowler marveled of the baby. Alma Lantsman is the smiling 9-month-old who gnaws charmingly on a toy ball and tugs at her great-great-grandmother’s earring. This was a special weekend for the five generations. Alma’s proud parents, Megan Hjelle-Lantsman and Lenny Lantsman, brought her to South Bethany from Alexandria, Va. Her grandparents Colleen FitzGerald-Hjelle and Robert “Bob” Hjelle flew in from in Los Angeles, Calif., delighted to meet their first grandchild (by one month). Great-grandmother Frances FitzGerald splits her time, living six months of the year locally. This was also the first experience with the Atlantic Ocean for the baby girl, who seems to have inherited her grandpa’s Norwegian eyes: rich brown, with a blue ring. “This is one of her first road-trips,” said Hjelle-Lantsman. As opposed to his wife’s extensive lineage, her husband, Lenny Lantsman, has a small family, so “every addition counts,” he quipped. He snapped photos of the visit, occasionally letting Alma test the equipment herself. Vinnette was married to Burt Fowler for about 58 years before his passing. Their South Bethany vacation house was built in 1968, and they moved there fulltime in 1980. Much of her family is spread across the East Coast, as well as in California. She had four children, 17 grandchildren, some 30 great-grandchildren and about 12 great-great-grandchildren, the oldest of whom is a teenager. Fowler “has passed on a lot of her loving and caring about people … and her assertiveness. Sometimes we have to learn it, but she’s got it naturally,” FitzGerald said of her mother. “And I feel like she leads a good example of how to enjoy herself,” Hjelle-Lantsman added. “She lives life to the fullest,” FitzGerald agreed. Fowler, Hjelle-Lantsman and baby Alma were all born in Sibley Memorial Hospital in Washington, D.C. When Alma entered the world, FitzGerald-Hjelle joked, there were three doctors in the room: the M.D. delivering the child, the J.D. in the bed and a Ph.D. about to become a father. Motherhood has changed over the last century. Now, Fowler sees young parents continuing their careers while raising children: “I think they’re very smart. … Look at the three of them. It’s perfectly wonderful how they’re raising this child in this day and age. … They know so much about what’s out there! Fowler estimated being about 45 “when I accidently came across somebody that needed me to work for them, which lasted about 20 years. “Things have changed … but it’s wonderful when you can see the young ones come up. They learn so much so soon, it’s wonderful,” Fowler said. “Ahhhhh,” the baby happily interrupted. “She wants you to know she’s still around!” Fowler said. “She’s cheerful and smiley and loud,” Hjelle-Lantsman said.